As many have remarked, when Team Sky launched they stated the aim of winning the Tour de France. It seemed far-fetched but my take was that when you have a big sponsor and you launch the team then you cannot say much else. Today this aim is now a possibility and in Sky’s management style, a big box to tick. The British squad is in a very comfortable position with both Wiggins and Froome in control and don’t forget it was the work of Edvald Boasson Hagen, Michael Rogers and Richie Porte that shredded the peloton. It split in the approach to the final climb, it exploded on the slopes of the Planche des Belles Filles. Obviously Sky are in total control. BMC had been praised for the way Evans was protected during the first week but his bulky bodyguards were fine for the flatlands but not today; by contrast Sky’s “lightweights” took control. Today’s climb was a very intense effort – Wiggins did 470 watts – and the Alpine stage plus the Pyrenees will be different because you can ride a full on pace to asphyxiate rivals today but this can’t be done on a full mountain stage where things are more tactical. So if we got some obvious clues for the overall, don’t extrapolate today’s riding too far even if it seems plausible to do so. Talking of tactics, who is the stronger rider between Bradley Wiggins and Chris Froome? There’s no question of leadership since Wiggins is in yellow and Froome is 1.32 behind. We’ll see how Froome fares in the time trial on Monday. Wiggins seems relaxed. His appearance in front of a microphone or TV camera is like the British weather, you can get dry humour and mild manners but other times he’s stormy or as impenetrable as the fog in a Sherlock Holmes tale. Apparently he was lording in the press conference after the stage and have an articulate interview on French TV. He speaks fluent French but had been declining to speak the local lingo but all seems well now. The conquest of the yellow jerseys is an interesting moment because Sky seem so methodical in their approach but Wiggins also took an emotional stance, mentioning what the jersey means to him, with his childhood dreams, his son and more. The result today was a bit skewed by some mechanical problems. Jurgen Van den Broeck dropped his chain and was out, Alejandro Valverde had a problem too. Whisper it but dropped chains are becoming a real problem for riders with electronic gearing. With traditional gear shifting if you drop the chain then you work the gear shifter to tease the chain back on but the electronic shifting is so fast you can’t do this the same way. It reminds me of a shoot-out in a western film where a gun jams. Surely the surprise of the day was seeing Rein Taraamae hang with the leaders all the way whilst big names were ejected? I tweeted a message of congratulations for Cadel Evans. Some took this the wrong way, as if I was not saluting Froome. Far from it, it would have been obvious to salute the Kenyan Briton. I merely wanted to remark that Evans was the only rider capable of attacking Sky. It didn’t work but at least he tried. Now we must see who else will attack. Nibali will aim to spring a surprise. He is one of the peloton’s best descenders so the predictable move is to attack over the top of a climb and then try to get a gap on the descent; quite possible for next week’s Alpine stage when the race goes over the Croix de Fer and the Mollard with some tricky descending before the final ramp to La Toussuire. If you want to know more about Chris Froome, I wrote a profile about him during the Vuelta last year. If you liked the climb then note it will be back in the Tour de France. The regional authorities want it to join pantheon of legendary climbs in France. The only way to achieve this is to send the race up again and again. What makes a piece of road into a mythical venue is the subject of a piece for another day but note Tour organiser Christian Prudhomme is already a fan of the climb. The spirits of the Galibier and Tourmalet won’t be troubled but use the Planche enough and people will remember its name. It’s worth noting this climb. If you watch the spring classics or the Giro d’Italia then double-digit gradients are the norm. But the Tour de France has been exceptionally conservative over the years. You could be forgiven for thinking France only has 20 mountain passes and certainly it’s true the Pyrenees don’t have too many roads. But the Alps, the Jura and the Vosges (today’s mountain range) are packed with tiny roads and giant climbs. Only these smaller climbs rarely if never feature so today was a small step in the race’s history, or rather its future. Expect more variety in years to come. There will be a proper stage preview on here as usual but it’s a hard day that will suit the attackers. I’m not sure the GC will be stirred up but word is that many riders have been saving their legs for Sunday, expect to see the breakaway specialists trying to get in a move. For example Gerrans, Chavanel, Roy or Gilbert. It will be televised in full, from start to finish. I was impressed by Cancellara! He is now 11th and if he does not loose much time tomorrow he will be back in the top 10 on Monday… in fact the top 10 now has a few good time trialists..
It’s a pity for him the race goes to Switzerland tomorrow but he’s just lost the yellow jersey. But he’ll still get a giant welcome. +1. Cancellara passed multiple climbing specialists today…it’s remarkable that he can pedal his massive legs up the steep as he did today! Yes, even on his own team he came in ahead of Horner and Kloedy. Unless I missed a mechanical on their part, that’s a very impressive ride by Cancellara. Cancellara blew me away, much like Thor last year. I think, if he hadn’t waited with the remnants of his fragmenting team and started his attack a little earlier, he might have stayed in the top 10. Chris Horner looked confused as he was clearly stronger than Frank and he stayed with Frank even after it was clear he wasn’t going to be able to do anything. Unfortunately, the team made a horrible decision in putting Frank as their main GC. Frank lacks that killer instinct and doesn’t dig in unless his brother needs him, which is unfortunate because I have seen plenty of indication that Frank might be the stronger rider of the two. Sadly he prefers to be his brother’s minder. Interesting to see Garmin riding on the front. They had little reason to commit, they’ve lost Hunter, Hesjedal & Danielson. Van Somersault was injured, as was Farrar, Dan Martin lost time with yesterdays crashes, so why didnt they simply wait, and profit from Team Sky efforts? They gained nothing, though I’m sure Sky were grateful. It was Team Sky’s responsibility to take control, not theirs. The *tactics* have to be questionable. Maybe it was just to show they could still work as a team? It didn’t work in results but after yesterday perhaps they felt like they needed to show themselves? I’m perplex too. Whatever the real reason, it will seem pretty thin. It also alienated AG2R, Saxo Bank, Rabobank and Astana for future cooperation. If Garmin gets on a breakaway, these teams might want to chase “just because”. It profiled as a good finish for Martin. Plus after their luck, I’d want to stay on the front too. Stage hunting? Pride. Frustration. Embarrassment? Dan Martin finished 1:39 behind Froome on the stage with CVV and Millar driving hard on the front for him. Three riders down and three employees of Garmin having just been named (leaked) to Telesport as having testified to the Feds and USADA is no picnic. Vaughters, CVV and Zabriskie all implicated. The increased pressure on these riders/reputations + JV during the Tour can’t be fun, compounded by the loss of Hesjedal and 2 other key riders. Same goes for Hincapie and Leipheimer. The four riders have already bowed out from the US Olympic team and for Big George, this is all going down as he’s retiring. So, they’re trying to keep their heads up amongst their peers as best they can — sad situation. Well, Miller wouldn’t mind doing SKY a favour after Cav got him a place in Team GB. But can’t imagine him doing that without the consent of his team. It’s important to note who’s mates are in charge of which teams. Garmin team car reportedly (JV comment) lost all visual tv reception on the climb (last 20min of stage). Dan Martin is @ 18min down on GC before the stage. The teams been decimated with crashes, injuries and abandoned riders. They are in effect *on the ropes* when the stage starts. They know that barring accidents, Twiglet should progress to the race lead. Team Sky have trained on all the crucial TDF climbs, and are waiting to race. All season so far, Team Sky mass at the front, lineup and use the TT train to reduce the bunch down. Paris Nice / Romandy / Dauphine, each done to good effect. So on the stage when BMC Sky Liquigas Radioshack have all been riding, in a bunch which still contained Cavendish before the final climb started, do they ride? They knew what Sky were going to do. Did Millar use the team for another reason? Who knows? I asked JV yesterday, he replied “Dan Martin” ……. Dan Martin lost 1min 38sec or so to Froome/Twiglet/Evans – so having Zabriskie VdVelde Millar driving on the front to achieve what? Doesnt add up – unless they all fell on their heads at some point. Years ago, Sky DS – Sean Yates was in charge of Salvodelli’s Giro with Discovery. They were leading, and needed help, so Peiper who ws DS then of Lotto, used his boys on the front to help, and later explained it by way of a *top ten preservation* of their own riders(name forgotten) position. Don’t be surprised if these *favours* occur. It happens often at this level. Just question the motive. huh? eh no they probably didn’t did that amazing Sky thing coming. They probably thought they had some kind of chance to win the stage. Who the hell is in the tour for appearances? Appearances like being at the front, breakaways make sponsors happy and SHARP just came aboard with Garmin-Barracuda at a tricky time. No matter the “tornado” going on within a team, they still gotta give all they can. Garmin’s a wounded puppy at the moment but their tail isn’t between their legs. You shouldn’t fault any rider or team for trying to win a stage. That’s what I like about Sylvain Chavanel this Tour — he keeps attacking and putting in impressive accelerations, but he can’t stay away…nothing to criticize him for. Dan Martin tells L’Equipe this morning they needed “to react, to show that we are still in the race. We tried, and it was the main thing, to be positive”. Let me be a little surprised that no one even hypothesizes the most usual reason in this case: trade. Dan Martin was as much as a favourite for this stage as Kessiakoff is for tomorrow. Michael Rogers and Richie Porte dropping Sanchez, Scarponi, Schleck, Rolland, etc. I know what you’re implying but it’s different if you know you can back-off in one kilometre rather than have to keep going to the line. You can go into the red and blow and it doesn’t matter whilst the others know if they’re on the limit they they have to back off to save a place on GC. I would in general agree, except for the fact that both Porte and Rogers finished in a faster time than Sanchez, while Porte was only 5 seconds behind Schleck, and Rogers 15. This is highly irregular, as if they were, as you say, going totally into the red and blowing, you would expect them to finish considerably further down than those riding tempo for GC, more like Boasson-Hagen (not saying he’s a clean benchmark) at 7″33, which was not the case for either Porte and Rogers. Further more, Porte’s increase in performance since last years Giro is highly irregular. From being a pretty useless mountain domestique for Contador who was dropped on nearly every mountain stage, to riding a tempo up the first real mountain in the tour that cracked riders with much better previous performances, only to finish in front of them, is not something which appears very often. Have you watched any racing this year other than the Tour? Sanchez is coming back from big injuries in the Dauphiné. Scarponi can’t have had the best few weeks building up to the Tour, and has already ridden the Giro this year. Frank Schlepp has publicly said that he has no form and doesn’t expect anything from the Tour. Rolland has been searching for last year’s results all year. Porte is not exactly a new revelation. He’s won the white jersey in the Giro and held Pink for some days. Mick Rogers is not an amateur at mountainous stage races, either. Porte did nothing of note in between his breakaway-assisted Giro result and signing for Sky and had done nothing of note beforehand either. Neither he nor Rogers have ever in their lives shown this kind of climbing form, nor have they ever previously been capable of dropping this quality of rider. Froome is an even more drastic case: prior to the Vuelta at the end of last year he hadn’t ever had a result in anything which ranked even with a Rogers or Porte. He had very rarely made the top 25 of a climbing stage in his life. We are talking here about someone whose wins at the Anatomic Jock race were amongst his top career highlights. Anybody who doesn’t think that these riders have improved to a drastic degree in recent times is willfully blind. It is even more astonishing that the all of the GC core of Sky’s Tour team have simultaneously improved to this degree. Let me be clear: Even in cycling, improvement does not equal doping. But it is not in question that there has been quite the improvement. I have, and while writing the post I took the factors that you mention into consideration. Despite these issues, I personally feel that Porte and Rogers do not have the class to drop Sanchez, or Schleck, and who knows how he really feels, up a hill which was being described as one which would be a major hindrance to Wiggins. Indeed, Porte is not a revelation, yet in the 2010 Giro, there were good moments of climbing, but he did not ride anyone of note off his wheel, and in the 2011 Giro, while riding for Contador, who does not really need team support on a hill, was completely anonymous. Similarly, when has Rogers ever displayed that kind of climbing, and if he has before, it was almost certainly in his T-Mobile days, which isn’t really a credible place to draw a clean performance from. This was a time-trialler’s climb. It’s not the Alps or Pyrenees, the climb was relatively short and required high power output. People have been saying Cancellara climbed really well, what does that tell you? Froome, Evans and Wiggins finished top 3: time-triallers. Porte and Rogers are both time-triallers. Schleck, Sanchez, Rolland, Scarponi, Dan Martin are NOT time-triallers. KP is dead right. Lets see what happens in the Alps. able to help VdB chase all the way back after his mechanical before the final climb]? – A. Kloden: Porte was 1:05 faster than Klodi who’s been riding fairly well. – P. Velits: Porte was 1:36 faster than PV who is an excellent climber. Jersey holder and Leipheimer (in good form), both solid climbers. *Subtract 10 secs for Rogers’ times against these same specialists. I tend to clang my cymbals for the winners before analyzing all the data…thanks to all of you who are noticing the obvious, the significant increase in performance. Clean until proven otherwise. And don’t forget either that none of them really crashed the last few days. Crashing — even if there aren’t any big injuries — can have a huge impact on the performance of a rider. Look at Rabobank. Kruiswijk, Gesink, Mollema did good so far and showed form in Suisse, but after their crash(es) they are struggling, while none of them have injuries other than a lot of road rash. Sky must be high on their success so far. Their moral is probably extremely high. Cavendish won a stage. Hagen finished top 3 twice. They are all starting to peak. During the stage everything goes to plan. Little reasons which together might make a big difference. I also know what you’re implying, but given the big noise being made by Team Sky about being clean, and the Team’s close ties with British Cycling (the UK’s national governing body), it would seem unlikely. Not sure that News Corp and fair play go hand in hand myself. I think everyone well knows the high ethical standards of News Corp. Anything necessary for a story is fair game. Or perhaps a result? Team SKY is cranking along like a well-oiled machine. Wiggins might have to watch out for Froome going after yellow, especially after Chris pulled him up the mountains to win the Vuelta. Another Contador v. Armstrong? Can’t say that the GC is looking clearer yet, too soon for that, but today’s stage was a solid indication of teamwork v. teams splitting into pieces strung out all over the mountain. Major attrition and many riders riding in a lot of pain today. 3:04, Leipheimer (OPQ) @ 3:47 — not done for, but would take some miraculous attacking in the days ahead to move up the GC. JVdB had an ill-timed mechanical, Brajkovic suffered on the steep today and Leipheimer says his form is good (? ), time will tell. Stage 6 felt like Stage 9 last year. New injuries, injuries worsening, and key abandons after a crash-filled fiasco. I’m really sorry to see Hesjedal exit and Garmin down 3 riders; Gesink and Mollema no longer in contention, and Wynants with rib fractures and a punctured lung. Freire gone and several more. Dreams shattered in the first week, but that’s bike racing. I must say that I agree with Voeckler’s remarks about the radio earpieces…22 DS’s yelling to their teams [all at once] to get up front on a 7-metre wide road! Can only fit so many in that space, and at high speed, crashes with serious injuries will happen. Get rid of the race radios, that’s my vote. Having dropped the chain on my Campy EPS twice now it is clear to me that you cannot fish it back on, but will have to stop and get off your bike. I assume all pros ride with guards/stoppers, but if VDB got his chain stuck between the inner ring and the chain stay on his Helium (as it did for me), it takes some serious wiggling to get it loose. Electric rides very smooth and changes gears so precise and quickly compared to mechanic systems, however; if things go wrong, they go really wrong. I wonder if we will start to see cable actuated front derailleurs paired with the electronic rears? Like back in the day – Armstrong sometimes had a downtube shifter for the front and STI for the rear. To save weight. It was my impression though (having never ridden Di2 or EPS) that the speed and strength of the electro front shifting (generally allowing front shifting under power) was one of its main drawcards, despite the inability to ease an inwardly dropped chain back into the inner ring. Not surprising then that frames are coming with chain catchers built in, and team mechanics installing aftermarket catchers has become de rigueur. I can’t see it, the manufacturers won’t want people to see riders using half the equipment, it would be an admission that the electronic shifting is not ideal. It just needs refining and some extra chain catchers added. There should be no electrical components in the drive chain full stop. This is bicycle racing where the machine is meant to be human powered. Having battery power on board to power part of the drive chain just seems so totally wrong to me. What next, electric motors turning the pedals? Oh, wait a minute……..
That would be a bit pointless wouldn’t it? The front derailleur is part of the deal which allows you to cross chain (hence more selection of gear ratio as well as not needing to jump up & down at the front). Maybe they can add another mode on the front where it simulates the maneuver to get chains back on. I dropped my chain on a di2 setup twice in one race (after I had fiddled with the limits — guess I learned my lesson) and it was a breeze to stick it back on the crank, in the same way one does with mechanical shifting. I’ve already seen problems caused by dropped chains on time trial bikes more than once in the last two years, and I believe I even commented here about it. Like a puncture, this is the sort of thing that one can normally easily recover from, except at critical moments of road races and in time trials. Electronic shifting sounds great (I haven’t tried it yet), but sometimes chains just get dropped, and having the ability to use the front derailleur to get them back on without climbing off the bike seems like it would be important in a race. Is electronic shifting so much better that it’s worth the risk of things like this happening? It seems like I read recently that Cancellara has stuck with mechanical shifting. Maybe he’s onto something. Terrific stage. Almost total destruction. It shows that teamwork can be employed to attack all-out instead of just defending and controlling. I hope Sky continue with this level of ambition and strength. The only possible challenge, besides downhill heroics, is for Wiggins to get past his “peak” fitness in the coming weeks, and Evans and Nibali getting better as the race goes on. But Froome can also be expected to improve over the days. Let me beg to disagree about the alleged scarcity of Pyrenean mountain passes. There are a whole lot the Tour (some of them pretty massive) has never even tried: La Llose, Souloumbrie, Dent, Creu, Roque-Jalère (in the Eastern Pyrenees), Arnosteguy, Ahusquy, Bouezou (in the Basque side), Spandelles, Couraduque or Beyrède (in the Hautes-Pyrenees), not to mention wonderful climbs that the Tour almost never uses anymore (especially the awesome Pierre St-Martin, but also Burdincurutchéta, Bagargui, Puymorens), and this only talking about two-sided passes, because tough unexploited cul-de-sac climbs such as Belles Filles there are literally dozens. And not mentioning the Spanish side either. Talking about mountain areas, I think only the Alpes-Maritimes are nowadays more ignored by the TdF than the Westernmost and Easternmost Pyrenees. The Alpes-Maritimes roads are apparently considered too narrow for the entire Tour caravan to traverse, though maybe the Giro could slip across the border for a day or two. Or maybe they could go to Slovenia or Finland instead. Garmin are depleted, with riders injueed. They had no reason to *show* themselves (or others) they can compete. That tactic today, had more to do with *old mates*. It’ll be interesting to see how Team Sky cope or handle with controlling the race. I think tomorrows stage will be neutered for GC – a break will go, perhaps even take the jersey, obviously dependent on who’s in it, but the TT will be the pointer. Team Sky will likely use the Garmin boys again, when the bigger mountain stages offer less options to recover, If you look at todays stage, how exceptional was it that such a big group is still in the front, incl Cav at 20km from summit? Cadel is used to being isolated. What’ll happen when the same occurs with Twiglet? Yes, I’m wondering the same thing. Over two weeks of defending the yellow? That’s a tall order. I wonder if BMC will send Gilbert up the road tomorrow in an effort to give Evans a launch pad for an attack? I agree with Bundle above on the myriad un/underused areas for the tour. Today’s stage definitely had the visual panache of double digit gradients at the finish to make it an easy choice for future races. “Result…skewed by …mechanical problems” – not skewed at all in my book, but shaped. I’m a firm believer in the race winner not just being the athletic winner, but also a combination of equipment & set up, support, route reconnaissance etc. that was an exciting day in the ‘mountains’ …….. the crowds were amazing (even tho 1 0r 2 got a shove or a squirt in their face) …….the made the day a special one…….. froome was dogged and proud and took the stage away from cadel by winning it for sky…..the twiglet raised a clenched fist to show his appreciation……… long way to go …… lets get this party started !!!!!!!!!! Don’t forget there’s a historical reason that most of the major historic mountain roads in France don’t have similar gradients to Italy and Spain: Napoleon. Part of his planning was that no road used as a supply route should be steeper than was passable by a fully laden wagon pulled by donkeys/asses. That tends to pitch out at around 12-14%, hence the preponderance of that sort of maximum gradient on routes familiar to the Tour across both the Alps and Pyrenees. I thought Evans looked pretty comfortable today. 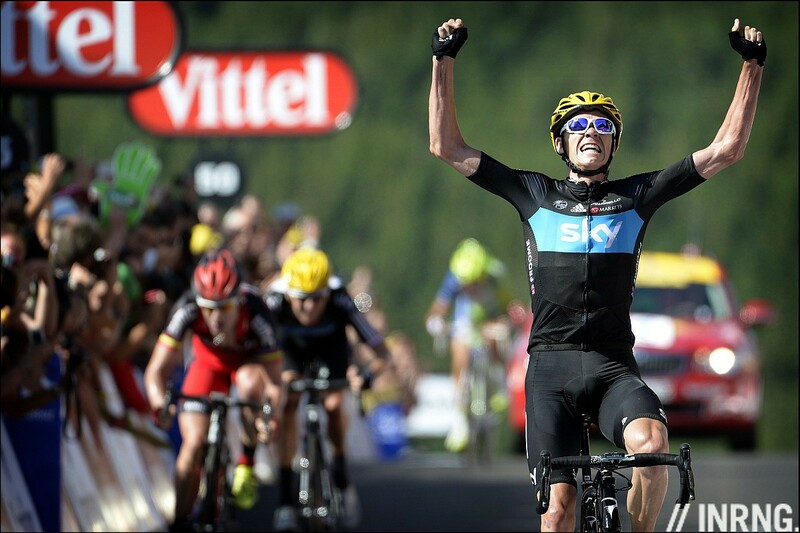 Certainly didn’t seem threatened by Wiggins, perhaps would have been more so by Froome had he been closer on GC. Evans has always given the impression that he doesn’t need a huge amount of cover in the high mountains, like others do. I thought Van Garderen looked like he was having a bad days. Interesting Burghardt tweeted that he was feeling a bit tired after all the work they’ve put in during the first week. I suspect they know they can challenge Sky but they can position themselves on them. Please correct me if I am wrong….but didn’t Team Sky hire some “questionable” coaches / advisers last year, based on those indiduals past history with certain practices. Look…I hate that we have to question everything, but the Team Sky train is raising eyebrows. Remember, this is a Murdoch operation, and this is London 2012. I hate that these suspicions arise in my mind. But this is not just Wiggo getting stronger….the entire team are dropping climbers with a Palmares to put most of these guys to shame. Could you be more specific? If you’re flinging mud, it would be good to be accurate. This is what I had recalled. Not trying to fling mud…trying to reconcile what I saw with my eyes this season with similar tactics of team in the past that are now well known to have been using questionable tactics. @Cat4Fodder hurrah for common sense. hurrah for common sense. @simon – read the entire comment thread with specifics of the markedly improved performance of many of the sky team. competent climbers now dropping pure climbers, sky domestiques finishing before other team leaders, riders formerly solid all rounders becoming climbing experts out of nowhere. Some of our British friends might be suffering from the same sort of home team blindness that affected many Americans during the LA days. Just because it’s your team doesn’t mean it’s all clean. You can call it slinging mud, but they’re legitimate questions. Not home team blindness. Perhaps “willful suspension of disbelief” is closer to the truth. It is what this American has employed for the last twenty years to continue enjoying the sport that I love. Kind of proves the point, doesn’t it? Yes and no. Maybe a red herring to their dominance….but I do not want to hear people tout their anti-doping stance. In my opinion the tempo riding of Sky actually suits Evans fine. A bit like Voekler being able to follow Evans’ tempo last year. They will not put him into difficulty that way. Not like a Contador/Schleck/Sanchez sudden acceleration. The real question therefore becomes can he attack them? And how will Sky deal with the one bad or unexpected day. Evans had them last year and it was how the team handled the adversity that won the TDF. Unless Sky has a perfect 3 weeks, which is a bit much to expect, we shall see when the chips are down, or at least potentially down. I’m biased as an Australian, and sensible enough to admit it up front, but regarding Rodgers, he has been at that level before, crashing while in virtual yellow etc. Mononucleosis (i think) laid him very low for a number of years, but when fit he won the tour of Calif. Porte is also a tt’er of note – see stage 20 last year. riding for Contador last year was a different proposition due to the time Contador lost etc. The key is they are basically TTing up the hills. Can they respond to proper accelerations? Fun to find out.. This Sky tactic has been coming for a while though. It has not appeared from nowhere. Do I like the style of racing? No, though vans did the same up the Galibier and its one of the most complete things i’ve seen. We need some Genuine rabbits and we’ll see what the greyhounds can do. @inrng – did any more (conspiracy theories) come from Matt’s (and Ned’s) comments/suggestions/etc in the ‘latest’ (mid April) Real Peloton podcast re Froome and Dr Ferrari? I remember a well-known Russian rider linked in this podcast to Ferrari but not Froome. Any time reference would be good. Instead Rendell has been tipping Froome all year as Tour winner. I thought (seemingly mistakenly) that their cryptic comments from 42:50 (e.g. 44:50 about ‘spilling the beans’, 47:40 about Froome’s ability to recover and 49:00 comparing his lack of early 2012 racing to the Chinese swimmers of the past) were insinuating this. I have to add my suprise and disbelief at the comments re the performances of Richie Porte and Mick Rogers (even with the ‘clean till proven guilty’ tags that guests love to add). You don’t get to be World TT champion thrice, win TOC, be the critics choice to win the 2007 TDF at the time of crashing in virtual yellow and be team leader at HTC for years when ill health probably robbed you at your prime. Porte is one of the worlds best time triallists and has declared his desire to be a GC candidate, and probably will be with his next team. Amazing what a huge engine, weight loss, better health, avoiding crashes and a clearly well supported team can achieve. Same for Wiggins. Same reason why critics are suggesting Cancellara should do like wise and consider becoming a GC contender. I would proffer a different perspective. Isn’t it amazing how the (early days I know) top ten on GC is dominated by UK/Aus riders (thus far seemingly ‘clean until proven otherwise’)…whereas dropping like flies are a whole bunch of prior podium finishers or near finishers with tainted pasts. I’d argue that this is the natural order of things with a cleaner peloton. We armchair ctitics, in many ways justifiably sceptical about results, should also even briefly consider the tragedy of a bunch of possibly drug-free cyclists who are performing well now, but have been deprived of potential grand tour results over the last decade by cheats. Problem that is still to be resolved: detecting PED use. Up until recently (may be ongoing), PEDs are taken but not detected. Until this is addressed, maybe in part by extensive, rigorous, retrospective testing, speculation is all we have. Firmly agree that hard tempo riding on ascents suits Cadel best. Against Andy and Alberto this is a fine defence, minimizing time losses (and perhaps having an advantage in ITT). With Wiggo the “sword” is blunted as they battle to a standstill. Leaving Wiggo with a “slight”* advantage in the ITT and Cadel with a likely advantage on technical descents and perhaps general GT insight. I would not discount Nibbles, Froome… and the specialist climbers?? I see many of them attacking/improving and giving substantial headaches to the “favs”. *likely will surpass Cadel in next ITT. Maybe Cadel will, in relative terms, come on strong in final ITT. 470 watts? The climb took just over 20 minutes. At Wiggo’s reported weight of 69kg, that’s 6.8 watts/kilo for 20 minutes which is pretty much exactly what dopestrong was reported to have pushed. I don’t think that benchmark is naturally achievable. Looking at the numbers it doesn’t seem right. Brajkovic was 46 seconds down and seems to have hit about 5.8W/kg. If Wiggins was doing 6.8W/kg he would have been much further ahead, no? Note it was about 16mins for the climb. Average watts per kilo is not the end-all metric for climbing success, where you lay down the watts is also quite important. Anecdotally, from my own efforts and those of my training partners, putting in more watts on steeper sections pays huge dividends even if you wind up with a smaller average overall. Therefore I wouldn’t jump to conclusions about the time gaps created by an average that doesn’t take into account gradients or other conditions. in that link you provided Brajkovic is quoted as claiming to have pushed 480 watts, yet the little pink line on the graph never even approaches 480 (with 1 minute smoothing). So maybe he glanced down at some point and saw 480 watts for a very brief time period, and maybe Wiggins did the same, later over-reporting his own wattage. I hope that is the case because 5.8 watts/kg is much more believable. This is a projection for the stage winning time based on Brajkovic’s data, some of which was missing with later correction (see posts on FB) – 470 watts is what they appear to have hit the climb at, with the initial conclusion being that, given an undemanding stage and a short final climb the numbers aren’t alarming. They are estimated in the region of 6.4W/kg for what was only a 16 minute effort. To put it in perspective we would see 6.4-6.7W/kg for 45 minuite climbs at the end of far more demanding stages back in the 90’s. Of course none of that proves anything but for now this completely unobjective fan is going to enjoy it – if I can’t now when will I? Here’s to more great racing next week. To be clear that’s an estimate of 6.4W/kg for the leaders not Braj who was 45 secs down.